Over 30 artists connected to the international mixed media collaborative platform Global Art Project (GAP) are participating within the CrossingBorders exhibition that will take place at the Sint-Amanduskapel – Campo-Santo – Visitatiestraat 2 – 9040 Sint-Amandsberg – Ghent – Belgium from August 31 till September 15 2019. The CrossingBorders exhibition will be officially opened on August 31 – 16.00 by Tineke Schuurmans representing museum Verbeke Foundation Belgium. 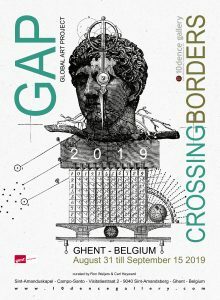 CrossingBorders is a conceptual collaborative group exhibition project for art professionals affiliated with Global Art Project GAP worldwide aiming on transferring the projects concept to the public and extending the participants professional international networks and art market. The CrossingBorders exhibition aims to bring together Global Art Project affiliated artists from all over the world, who are highly motivated to collaborate with each other across national borders with the ambition to enter each other’s markets artistically. The curators of the CrossingBorders exhibition, stimulate and expect a conceptual reflection on distances or barriers, included in the perceptual context of a border, a blocking in thinking, acceptance and/or understanding by means of political issues, globalisation, (im)migration, climate change, gender, race, culture, religious racism, terrorism, genocide, war, misogynist behavior, feelings of fear or superiority etc etc… In other words, the GAP artists will reflect upon their own conceptions about what constitutes a border or boundary and what it means to cross it. Furthermore, the CrossingBorders concept also strongly intends to reflect on the role of migration as embodied in works of art. Centring on the physical and conceptual manifestations of the effects of migration and migrants on art. This issue also invites a focus on diasporas of practitioners and their reception by new audiences or consumers. The current ‘refugee crisis’ represents, above all, an international political crisis as lack of coordinated action that for instance has stretched the European Union relations almost to breaking point. In many countries populist right wing parties have been given a new lease of life with increasing numbers of people turning their backs on an open and liberal society. CrossingBorders stimulates reflection on the role of migration as embodied in works of art, material culture and their conservation. Global Art Project (GAP), founded by Carl Heyward, Akiko Suzuki, Lorna Crane, Chaewon Oh and Vered Gersztenkorn is an international group of artists with diverse interests and backgrounds; their common belief in art making as a natural part of the human condition, and collaboration as a key component, enables them to produce work that embodies a special kind of truth. Like the Fluxus artists, the principles that underlie the GAP philosophy include the belief that trusting the process of making art is fundamental to its creation, that art as a means of communication has a universal, cross cultural reach, and that education is not essential to understanding or appreciating of a work of art. It is unrestricted and available to all, not only those who can afford to purchase art or visit museums where carefully selected precious objects are carefully guarded. Going beyond the surrealist’s concept of “automatism,” the GAP artists yield to the release of the separate and distinct grasp for the sake of a combined learning and aesthetic experience. Much of the work produced by this group is characterized by raw energy combined with elegant, intuitive, unplanned design. Implicit mutual faith, relinquishing of territorial boundaries, and conviction that the result will reflect the authenticity of the experience are essential to the practice. It is different from “group think”, or individual artists working on a project together. The concurrent action of the workers, without a predetermined program or plan, instigates a communal vision, giving rise to aspects of the unknown which would have otherwise been unreachable. Each mark, stroke, gesture, shape, color, and texture retains its intrinsic qualities while transforming into a collective composition. The process takes time, so there is an element of sequential movement to the work. The time that it takes for the eye to travel around a composition, following the impulses of the various artists involved in its creation, is an interesting variable in this process. While often nonobjective, the content of the collaborative work sometimes contains explicit images of public figures, or recognizable icons juxtaposed with self-contained formal elements. The results present us with an interesting dichotomy because, like all two dimensional art, it is seen instantaneously, but can often be best appreciated over time. The nature of this work is provocative on many levels, and has endless possible routes to the yet to be discovered. GAP is linked by activity in mixed-media art practice, which may be reduced to working with the materials at hand and has antecedents in collage, assemblage, found-object and related practice. Their affinity with Fluxus, Cobra, and the Dada Art Movement is a recognition of the importance of being attuned to the collaborative future.